This is hard to fathom in a country where religious leaders condemn gay unions as "un-African" - and those who dare to declare their partnerships openly often receive a hostile public reaction. If a woman has never had any children, she takes on what is regarded as the male role in a marriage, providing a home for the younger woman, who is then encouraged to take a male sexual partner from her partner's clan to become pregnant. "I married according to our age-old tradition, where if a woman was not lucky enough to have her own children, she got another woman to honour her with children," says 67-year-old Juliana Soi. Sitting on armchairs placed in the shade outside her grass thatched home in Rift Valley's Elburgon area, she tells me she married Esther in the early 1990s. Esther, who remained demure during the visit and too shy to speak to me, is 20 years her junior and together they nominally have five children. "You know children are like blankets," says Juliana. "And one needs to have their own blanket so that you do not have to go to your neighbours' house at night to ask for a blanket since he will definitely be using his at that time." This customary arrangement - practised among Kenya's Kalenjin (encompassing the Nandi, Kipsigis, and Keiyo), Kuria and Akamba communities - has come under the legal spotlight recently because of an inheritance case currently before the courts in the coastal city of Mombasa. In a landmark ruling, the high court last year recognised that, in accordance with Nandi customary law on woman-to-woman marriages, Monica Jesang Katam could inherit her late wife's property. However, the relatives of the dead woman - who was the older partner in the marriage - are challenging the verdict. A large house in Mombasa is at stake. If the appeal fails, Franklin Chepkwony Soi should have no difficulty in claiming his inheritance rights when he is older. "I was born here at Juliana's house and Esther here is my mother," the 20 year old explains. "This lady Juliana married my mother because she wanted some sons to inherit her property." He says he does not know who his biological father is - and is not interested to find out. He adds that he has never experienced any social stigma and the small community in Elburgon accepts their family. But his parents are at pains to point out that they do not have a sexual relationship. "No! No! Nothing sexual takes place," says Juliana, adding that the two women sleep in separate huts. Pointing at Esther, she goes on: "By the time a woman like me decides to marry a young woman like this one, I must have reached menopause. "At that stage any love activities are for the young woman." The couple laugh as she adds: "A woman my age is like an aged cockerel - too old to do anything." This mainly rural practice of a barren woman marrying another woman for the purposes of having children is slowly fading away. 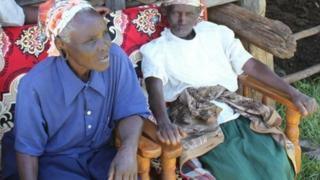 In some communities in western Kenya, where modern fertility treatments are not accessible, polygamy is the preferred way of dealing with infertility. A wife who is unable to have children will often encourage her husband to remarry so the family can have children. But the Mombasa ruling could challenge this patriarchal approach and give woman-to-woman marriages a stronger footing in the modern world.